When your roof needs repair, it's not something you can delay - water can cause enormous, expensive problems. The roof insulation will be soaked, the plaster will be soaked, and the ceiling may need replacement. If you see any sign of water intrusion - such as a trickle down a wall or a damp spot on the ceiling plaster - then the problem needs to be fixed before it causes serious damage. Otherwise, it will cost not just the roof repair, but the ceiling will need replacement. 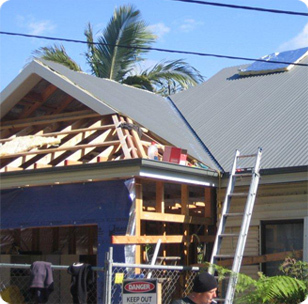 Tandem Trades - Metal re roofing specialist in Sydney, works in Sydney and surrounding suburbs, and provides a complete metal roofing service. Whether its tin roofing, corrugated or Colorbond and Zincalume metal roofing, Tandem Trades can fix, repair, replace, upgrade or change your roof. Call Mick - Professional metal re-roofing contractor in Sydney, on 0439 417 147, for an obligation free inspection. The Australian sun is extremely damaging. Concrete tiles lose their painted surface, and absorb water, then leak. Glazed tiles become brittle; the glazing develops fine shatters and cracks, and it's even worse if someone walks on them, for cleaning or to install an antenna, they won't tell you that they cracked a tile. The weakest points in your roof are the metal valleys - if you are in a leafy suburb, you can be certain that leaves and small branches have landed on your roof, and may be blocking your valleys. The leaf mulch doesn't dry, and allows the water to create rust. If you have flashing that is rusted or cracked, that will cause leaking into your roof. We can replace the flashing to ensure your roof is waterproof again. Tandem Trades is realistic - there are many roofing companies we compete with. So, our quotes are as low as we can make them, and still do a great job! We thoroughly inspect and assess your roof, identify the repairs to be carried out, and then we discuss our findings with you. Whether it’s a new metal roofing, roof construction, roof repairs, roof ventilation or metal reroofing, just call us on 0439 417 147 for an obligation-free quote. We offer new metal tin, Colorbond, Zincalume and corrugated roofing, roof repairs, re-roofing, roof ventilation, roof insulation services throughout the greater Sydney area including Sutherland Shire, St George, Inner West and the Eastern Suburbs Sydney for all residential, commercial and industrial customers.